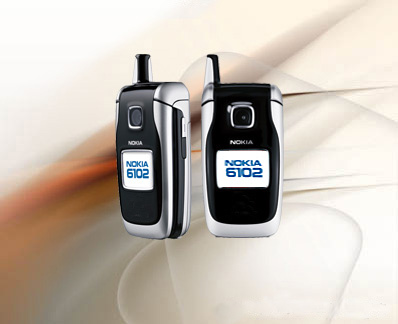 Nokia 6102i (photo above)/6103(photo under) phones add popular Bluetooth technology to highly successful mid-range compact fold design. Nokia today announced the Nokia 6102i and Nokia 6103 phones, both of which add the convenience of Bluetooth technology to the already strong feature sets found on these compact mid-range fold-style phones. The Nokia 6102i phone carries on the same striking design found on the Nokia 6102 phone, while the new Nokia 6103 phone features an updated modern look but retains the compact size and exceptional ease-of-use that made the Nokia 6101 phone such a hit with customers. The Nokia 6102i and Nokia 6103 phones will be available in a GSM 900/1800/1900 version primarily for markets in Europe, Africa and Asia while a GSM 850/1800/1900 version will be available primarily for markets in the Americas. Both phones are planned to be available during the 1st quarter of 2006 and are expected to retail for approximately €200, before applicable taxes or subsidies. The addition of Bluetooth technology to this popular phone platform opens up a myriad of options for owners to increase the productivity and convenience of their mobile experience. Nokia offers a wide array of Bluetooth technology-enabled enhancements such as wireless car kits and wireless headsets as part of its line of mobile enhancements. Today, Nokia announced a new trio of wireless headsets including one of the smallest such devices ever made available. Additionally, with an increasing number of products being introduced to market incorporating Bluetooth technology - from laptops to automobiles - owners of the Nokia 6102i and Nokia 6103 phones will find an ever expanding number of ways to use their mobile devices. Along with Bluetooth technology, the Nokia 6102i and Nokia 6103 phones offer a strong feature set including a VGA camera with dedicated camera key, Nokia Xpress audio messaging for sending audio clips with just the touch of a few buttons and dual color screens with support for animated wallpapers and screensavers. Synchronizable contact and calendar information, voice dialing and recording and a built-in handsfree speakerphone make the Nokia 6102i and Nokia 6103 phones a perfect productivity companion, while an integrated FM radio and downloadable content support including MIDI and MP3 ring tones, themes and games satisfy the need for fun.